It’s been a whirlwind of holiday home tours in blogland the last few weeks, and I’ve been sharing my holiday home room by room. 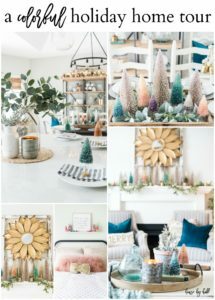 Today, I’m happy to put all the pictures of all the decorated rooms together for one big Colorful Holiday Home Tour 2018. I’m joining the Seasonal Simplicity Holiday Tour hosted by Krista from The Happy Housie. If you’re stopping by from Clean and Scentsible, welcome! I change up my strategy from year to year when it comes to decorating my home. This year, I was all about incorporating pops of deep teal and blush pink. They aren’t your traditional holiday colors, but they definitely make the house festive and happy. If this isn’t your first time peeking around my holiday home, than I apologize for being a broken record, but I just can’t stop talking about my love of bottle brush trees! I’ve always loved them, and this year I just went a little nuts. They cover just about every surface in the house! Here is a rare shot of the entire living room. I hate shooting into that ginormous window, and I kind of avoid this angle, but it’s the only way for me to show you the entire space! This little vignette decorates the coffee table perfectly. We’ll move along to the kitchen! My kitchen holiday decorating was pretty light this year. Just a wintery vignette for the center of our island, and some little place settings at each of our seats.